Like to explore the career opportunities and paths further? To take your first steps towards beginning a career in hardware click on the links below to find out more information! For more information on a potential career in the hardware industry, please contact your School Industry Liaison Officer, Career Counsellor or your local hardware store operator. Australia has a shortage – a shortage that you could help us fill with a traineeship. You can start your traineeship in the Hardware Industry while you are still at school – and get paid! How good is that! A traineeship is open to you once you turn 15 year old. If you take up an Australian School-based Traineeship, you can undertake a nationally-recognised qualification part-time as a trainee and earn a wage – while still working towards your secondary school certificate. 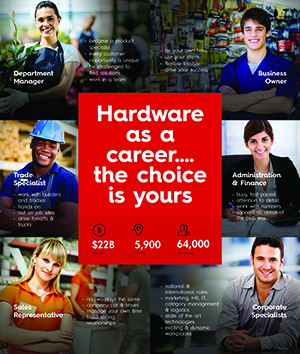 Consider Hardware as a career option and there are many career pathways available. Talk to your school careers adviser, parents and friends about the careers that you could do in the Hardware Industry. Look at recruitment ads to see what skills are needed. Register for job alerts in the Hardware Industry. Your school careers adviser may know or help you find an employer who would like to employ you as a trainee.